Whilst Pseudo-Elijah pronounces divine judgment upon Israel, other Prophecy teachers are preparing their disciples for the arrival of "the Messiah" following the emergence of said prophet, Elijah. Popular Prophecy Club speaker and author, Grant Jeffrey, also a foremost proponent of Bible Codes, aka Gematria, commends to his readers the teaching of the Jewish rabbis that Elijah will appear either 3 days or 3 years before the Messiah. An excerpt from Jeffrey's book, Prince of Darkness, is found on the BPR/Philologos web site following a lengthy commentary on Elijah from Dr. William Smith's Dictionary of the Bible. Grant Jeffrey's comments, although brief, appear to be setting up his readers for a false messiah who will be introduced by a counterfeit Elijah and heralded by Michael the Archangel! "Over the centuries the Jews have developed a number of traditions about Elijah the prophet. . . His appearance as the forerunner of Messiah will motivate the Jewish people to national and individual repentance. The rabbis believe that Elijah and the Messiah will usher in a time of peace and harmony for all nations. They believe that Elijah will resolve all legal questions and the discrepancies in religious law (Halachah). In addition they expect him to establish the proper rituals for the restoration of the Temple service. Curiously, they describe Elijah as a partner to Moses in God's coming kingdom, the same role that Aaron used to perform during the Exodus. "The rabbis teach that Elijah will appear at some point in time (either three days or three years) before the advent of the Messiah. They anticipate that he will appear in Palestine and utter a lament over the devastation of the Holy Land. After Michael the Archangel blows his trumpet, Elijah will introduce the Messiah to the world. The Talmud claims that several wonders will accompany the coming of Elijah and the Messiah: (1) He will bring Moses back to life. (2) He will reveal the secret location of the three holy vessels that mysteriously disappeared: the Ark of the Covenant, the Flask of Manna and the container of sacred anointing oil. (3) He will carry the royal scepter of Judah which God promised 'shall not depart from Judah. . .until Shiloh come' (Gen 49:10). (4) He will transform the geography of the Holy Land, leveling the mountains. "Another curious belief of the rabbis is that Elijah will be one of the eight princes that will form the cabinet of the Messiah. Additionally, they tell us that Elijah will restore the tribal identities of the Jews." 1. Rather than interpreting Revelation 11 exegetically, Grant Jeffrey has substituted the Jewish rabbis' less severe version of Elijah's ministry. In the rabbinic version, Elijah does not prophesy for three and one-half years, devour his enemies with fire from his mouth, prevent rain, turn the waters to blood or smite the earth with plagues. Grant Jeffrey seems willing to accommodate Jewish unbelief and pander to their expectation of another Elijah -- who will prepare the way for a more palatable messiah than Jesus Christ. Mr. Jeffrey's statements are worrisome. What is meant by Elijah's resolution of ALL discrepancies between the religious and legal system? Will Elijah oversee a restoration of the Sanhedrin to administer The Noahide Laws? Could Michael the Archangel possibly be Prince Michael Stewart of Albany, president of the European Council of Princes? Will Michael -- as the "Prince" of Daniel 12:1 -- introduce the false messiah of the Merovingian dynasty -- perhaps the next Grand Master of the Prieuré de Sion whose name is "John" or "Jean" following the line of succession of Grand Masters of the Prieuré? Will this counterfeit messiah be given the Scepter of Authority which, according to Hebrew Roots teacher Peter Michas' book, The Rod of the Almond Tree, is a branch from the legendary tree of crucifixion? If so, will he perform signs and lying wonders with this "divine rod" -- as it is termed by Peter Michas? Will pseudo-Elijah call down fire from heaven in imitation of the true prophet Elijah, but in reality be the False Prophet of Rev. 13:13 who also "maketh fire to come down from heaven"? Will pseudo-Elijah restore the Arkite Worship of the Kabbalah, the Jewish book of the occult? Will pseudo-Elijah and the false messiah destroy Mount Zion in Jerusalem and reinstitute the false worship of Mount Sion/Hermon, the historic center of idolatry in the land of Israel. Finally, will the false messiah be found to be of the idolatrous Tribe of Dan when pseudo-Elijah restores the identities of the Lost Tribes of Israel? According to Jewish Kabbalist, Avi ben Mordechai, whose prophecy teachings are also circulated by BPR/Philologos, the messiah will appear six months following Elijah, who will also be associated with the resurrection of the dead on Rosh Hashanah. It was even taught that Eliyahu had three cities in Y'hudah [Judah] from which he would again begin his ministry. . .According to Jewish expectation, Eliyahu will emerge before the resurrection from one of these cities (ruins) and not in the desert as was Yochanan the Immerser [John the Baptist]. . . .I believe Eliyahu and Mosheh will return in the flesh prior to the resurrection and rapture on the Day of the L-rd. How soon before the Day of the L-rd will they appear? I am not sure about Mosheh but I think Eliyahu will come six months before the resurrection because Yochanan (a type of Eliyahu), who was a forerunner of Mashiach, was six months older than Y'shua. And if Y'shua comes for His bride at Rosh Hashanah then Eliyahu will appear in Israel at Pesach. Why Pesach? Because that is when Eliyahu is expected. For almost 2,000 years, Jews every year at the annual celebration of Pesach prepare a table-setting for him. In the ancient Jewish writings including the Tanakh the resurrection is scheduled for the Feast of Trumpets (Rosh Hashanah) which is called an "appointed time," or in Hebrew, a Moed. For their interpretation of Bible prophecy, Avi ben Mordecai and Grant Jeffrey both rely upon the rabbinic writings, in this case the Babylonian Talmud and Midrash. It is a fact that modern Judaism is not based on Scripture, but directly descended from the religion of the Pharisees of the first century A.D. These "traditions of the elders" -- which Jesus argued were the cause of the Jews' transgression of God's commandments -- have been preserved in the vast work known as "the Talmud". Jesus never endorsed the traditions of the Jewish rabbis. Rather, His most scathing rebukes were directed at those who "made the commandment of God of none effect by your tradition." The Jews refer to the Talmud as a VAST SEA. Rabbi Berel Wein's description of The Talmud: Book of the Jews explains: "No wonder the rabbis referred to the Talmud as a vast sea in whose waters one must quickly become an excellent swimmer so as not to drown." Michael L. Rodkinson, a Jewish scholar who edited the English edition of the Babylonian Talmud , a monumental work, and wrote a series of volumes titled, The History of the Talmud , describes the Talmud as a "vast sea" prior to its compilation in written form. Revelation 13 opens with the apostle's vision: "And I stood upon the sand of the sea, and saw a beast rising out of the sea, having seven heads and ten horns, and upon his horns ten crowns, and upon his heads the name of blasphemy." Please recall that the Bistea Neptunis or "beast of the sea" -- which is believed to be "ever incarnate in the dynasty of ancient kings" and whose symbol was a fish -- identifies the mystical Merovingian Fisher-Kings, who believed they were of the bloodline of Jesus Christ. [The Rosicrucian Connection] Their origins are actually found in the Tribe of Dan, whose pagan worship is revealed in the Old Testament. "When I did my undergraduate degree as CSUB [California State U. Bakersfield], I took a class in Judaism, offered through the humanities dept. I still have the textbooks and thought you'd like a little insight from the jews themselves. In the book entitled THE BOOK OF JEWISH BELIEF by Louis Jacobs (1984, Behrman House ISBN 0-87441-379-6), on page 60 from the chapter on 'TALMUD AND MIDRASH' is an enlightening quotation "The Talmud is like a vast sea, requiring expert navigation to sail safely through its often turbulent waters." I firmly believe that mystery Babylon is the Babylonian Talmud, and that when Revelation says that the Beast rises from the sea, it's not humanity but the Talmud, the unholy writings that spawn the beast. The Jews refer to the Talmud as the 'sea' not humanity, which is the popular Christian teaching of the day. Also in this text are chapters on Kaballah and a writings on the Jewish belief in reincarnation. They also refer to the world as COMING INTO A ONE WORLD RELIGION OF JUDAISM. They call Christianity and Islam daughter religions that are readying the world to accept Judaism." "Christians have failed to understand a Biblical principle that ISHMAEL (Morman belief and British Israelism) comes before ISAAC (the true belief, understanding and restoration of both houses of Israel) through a world-wide sovereign outpouring of God's Holy Spirit (Ruach HaKodesh) otherwise named the SPIRIT of Elijah who is turning the hearts of the children (Christianity) to the fathers (Judiasm) and the hearts of fathers (Judaism) to the children (Christianity)." 2. "Many believers in Messiah who are embracing their Hebraic roots in Messiah and even 'Jewish roots' ministries are still not sure if they believe in the two houses of Israel or in an end-time restoration of both houses of Israel (referred to in the OT as the house of Israel (Northern Kingdom) and the house of Israel (Southern Kingdom). Today, the two houses of Israel are known by the more common names of Judaism and Christianity. Both believe in the God of Israel. Both believe in redemption. Both believe in a personal Messiah. Yet, there culture and their history and their customs have been historically quite different (much like the history, customs and worship style of the Northern Kingdom differed from that of the Southern Kingdom). "Why are even believers who embrace their Hebraic roots in Messiah still having a difficult time of grasping, believing and understanding the prophecied restoration of both houses of Israel (Ezekiel 37:15-28). Well, I believe that there are several reasons. "The most basic reason is the absolute emphasis within Christianity of PERSONAL redemption. PERSONAL redemption is emphasized so much that NATIONAL redemption is not a part of their thought process. Meanwhile, one of the major reasons why Judaism has a difficult time accepting Yeshua/Jesus as their PERSONAL Messiah is the absolute emphasis on Jewish COMMUNITY and the NATIONAL redemption of God's people as foretold by the prophets of Israel." According to Chumney, Christians have failed to appreciate the message of Jewish-Christian rapprochement [restoration of the lost tribes to Israel] because of the Mormon and other British Israelite cults which pervert the doctrine. Just how Mormon/British-Israelism differs from Chumney's version of the reunification of lost Northern/Southern tribes of Israel is not clear. 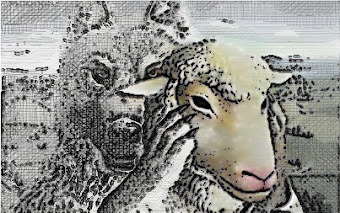 "Another reason why corporate Christianity and even those believers in Messiah who are embracing their Hebraic heritage in Messiah have to stop, look and listen and chew and rechew before they begin to understand that THEY are a part of the restoration of BOTH HOUSES of Israel is because the enemy (HaSatan) has sowed perversion and distortion in the belief in the two houses from groups that most Christians view as being outside of the mainstream of Christian belief like the Mormans and those who espouse "British Israelism"." 3. Eddie Chumney hopes his readers will miss the fact that he is really teaching British-Israelism, the Northern Kingdom being the ten lost tribes of Israel which migrated to Europe and then the British Isles. Chumney's interpretation of the Ezekiel 37:15-28 is identical with that of the Scottish Stewart Clan, a Merovingian "sacred family" claiming direct descendance from the bloodline of Jesus Christ. "Say unto them (Israel), Thus saith the Lord GOD; Behold, I will take the stick of Joseph (House of Joseph), which is in the hand of Ephraim, and the tribes of Israel his fellows, and will put them with him, even with the stick of Judah (House of Judah), and make them one stick (one nation), and they shall be one in *mine hand*." These sticks are literal wooden sticks which were used to represent the divided Kingdom of Israel which had become the House of Judah and the House of Israel. (See 1 Kings 11) The two sticks mentioned in Ezekiel are not books or scrolls -- they are people -- as the Scriptures will document. The sticks simply represent people. Note verses 16 & 17: "Moreover, thou son of man, take thee one stick, and write upon it, For Judah, and for the children of Israel his companions: then take another stick, and write upon it, For Joseph, the stick of Ephraim, and for all the house of Israel his companions: And join them one to another into one stick; and they shall become one in thine hand." "22 And I will make them *one nation* (one stick, one people) in the land upon the mountains of Israel; and one king (Christ) shall be king to them *all* (Shiloh; Whose right the Stone of Destiny represents): and they shall be no more two nations (two sticks), neither shall they be divided into two kingdoms any more at all:" Can Christ be a King over anything except people? These two sticks being joined are specifically used to remind the descendants of Israel, even today, that they will yet be reunited into one nation -- a single people -- in the original land given to Abraham! 4. Proponents of British-Israelism understand that the shift from the narrow gospel of personal redemption to the Jewish message of national redemption is not going to be easy for Christians. For five hundred years the Church has been preaching a gospel of personal salvation through faith in Jesus Christ and, for the most part, Christians have not been open to change the message. However, Rick Joyner has declared that the Reformation is not over -- the final stage will be the return of Christianity to its Jewish Roots! But how will the Messianic change agents move a resistant Church from the Christian hope of heaven to the Jewish hope of an earthly homeland? To discover the answer to that question, we shall turn to the Messianic Jewish Alliance of America [MJAA], which was instrumental in the transformation of the Messianic Movement from Hebrew Christianity into Messianic Judaism. “In 1966, under the auspices of the HCAA, the Young Hebrew Christian Youth Organization (YHCYO) was begun; in 1967, it became the Young Hebrew Christian Alliance (YHCA) . . . (in 1975, the YHCA was renamed the Young Messianic Jewish Alliance of America [YMJA]), and began to surpass the parent organization in membership and enthusiasm. Many of today's leaders of the Messianic Jewish movement have come from the YHCA, energized by the 'Jesus movement' of the late 1960s and early 1970s. An obvious 'generation gap' grew between the older 'denominational' Hebrew Christians and these younger 'Messianic Jews.' The upcoming generation wanted to change the styles of worship and evangelism to a more Jewish context. It was also at this time that 'Jews for Jesus' began. “Martin Chernoff became the President of the HCAA (1971-1975), and led the group towards Messianic Judaism (his sons, Joel and David, also served as Presidents - 1979-1983 and 1983-1987, respectively). In June of 1973, a motion was made to change the name of the HCAA to the Messianic Jewish Alliance of America (MJAA); however, a two-thirds majority vote was necessary to effect the name change, and only 62% was received at this time. Two years later, though, there was enough support, and in June of 1975, the name was officially changed to the MJAA. The (mostly young) supporters of Messianic Judaism had won out; the name change was significant as more than just a "semantical expression;" as Rausch states, "it represented an evolution in the thought processes and religious and philosophical outlook toward a more fervent expression of Jewish identity." “The revival of the concept [Messianic Judaism] really began in the late 1960s, and came to fruition in the early 1970s . . . The leading organization of this movement is still the MJAA (the former HCAA), being the largest of its kind in the world, and representing the estimated 100,000 Messianic Jews in the United States. It is part of the larger international alliance formed in 1925, and encompassing thirteen countries. The MJAA is headquarted in Philadelphia . . . For some years, the MJAA followed the practices of the HCAA and established local branches in various cities. However, these branches gradually began to go out of existence as a new phenomenon grew: Messianic congregations and synagogues.” 5. "Jews for Jesus (JFJ). Founded in California by Moishe Rosen . . . His 'group' had started as a mission of the North Carolina-based American Board of Missions to the Jews (ABMJ), who sent Rosen (an ordained Baptist minister) to California in the early 1970s. He was so successful that they brought him back to New York to train other Jewish evangelists, but eventually he returned to San Francisco, populating JFJ mostly with born-again hippies (Jewish and Gentile). In August 1973, the ABMJ terminated Rosen's position as he became less denomination-oriented and more Jewish-oriented (messianic); the other eleven members of the mission also resigned from the Board in order to stay with JFJ. Their primary focus at this point had to be on raising financial support, since ABMJ funds had been cut off. This support came mostly from churches, so JFJ toned down their youth culture image, presented more and more of a Jewish image, and developed a 'Hebrew Christian' ethnic identity." 6. "We had to bridge the culture gap. Jewish missions in general had neglected the principle of indigenousness: winning those of a specific nationality, tribe or social segment to Christ and training them to witness to their own people within the framework of their own culture. A communication gap existed between the missionaries and the Jewish people they wanted to evangelize. The missionaries expected Jewish believers to behave like Gentiles when they came to Christ, almost as though eating non-kosher food or totally ignoring Jewish holidays would prove that they were Christians. "Heeding Paul's example to be as Jews to those who were Jewish, we began to use elements of our own Jewish culture in evangelism. We wrote Jewish melodies to sing praise to Jesus and on Jewish holidays, such as Passover and the Day of Atonement, we pointed to Him as the Lamb of God and our atonement for sin. Instead of retreating from our Jewishness, we valued it. This showed those we wanted to evangelize that coming to Christ did not mean abandonment of the God of Abraham, Isaac and Jacob, and that Christ is the fulfillment of the Hebrew Law. "We had to raise our profile. Until 1970, it had been relatively easy for Jewish community leaders to state that Jews did not believe in Jesus. This false premise seemed true because the Jewish believers generally were not visible. Even though numbers of Jews received Christ, they tended to assimilate, leaving their testimonies unheard in the Church and in the Jewish community."7. “But Messianic Judaism properly so called, sees this evangelism within a different framework from the Evangelical mainstream. The crucial difference is that Messianic Judaism sees itself as still part of Israel, even if a rejected part, and thus acceptance of Jesus as the Messiah of Israel does not, or should not, involve a rejection of Judaism. By contrast, the classical Evangelical missions to the Jews see Jewish believers as ‘coming out’ of Israel into the Church; there is no ongoing identity with the whole of Israel. Thus, in the view of the Messianic Jews, they form ‘the saved remnant of Israel’.” 8. Predictably, this non-threatening version of the gospel has facilitated alliances between Messianics and other inclusive variations on Christianity. Over the years, the leaders of the Messianic Movement have forged ties among those of like compromise and become major players in the worldwide ecumenical movement. Joel and David Chernoff, who served as presidents of the MJAA in 1979-1983 and 1983-1987 respectively, were speakers at Israel's Jubilee Celebration sponsored in 1998 by the Christian Alliance for Israel. The Chernoffs, whose father, Martin Chernoff, supervised the transition from the Hebrew Christian HCAA to the Messianic Jewish MJAA, shared the speaking platform at Israel's Jubilee with the following key figures in the ecumenical movement: Alan Keyes (CNP), John Hagee, Benny Hinn, Jay Sekulow (CNP) (ACLJ); Marty Goetz, Paul Zink (Roman Catholic); Wellington Boone (PK); Rabbi Robert Cohen, Jan Willem van der Hoeven (Christian Embassy), Tom Hess (CNP); Mahesh Chavada; Rick Joyner, Dan Juster (TIKKUN International) Ulf Eckman, Mike Bickle, Glen Campbell, George Otis (Sentinel Group), Sid Roth (Messianic Vision) and Stephan Strang (Charisma Magazine). Daniel Juster, Ulf Eckman, Moishe Rosen and other JFJ officers are also popular speakers at conferences for the Lausanne Consultation on Jewish Evangelism [LCJE], the Messianic Jewish sector of the ecumenical Lausanne Consultation on World Evangelism [LCWE]. The chairman of the LCJE International, is Tuvya Zaretsky, Chief of Station of Jews for Jesus in Los Angeles. Tuvya Zaretsky also holds a position on the International Lausanne Committee. The rapprochement between Judaism and Christianity is nearing completion. A message from Bridges for Peace on the The Elijah List web site displays the following headline with a statement from Jewish rabbis applauding the shift in Christianity toward accommodation, rather than evangelization, of the Jews. Dozens of rabbis and Jewish scholars, saying that "Christianity has changed dramatically," have issued a broad treatise on Christianity and interfaith relations, stressing that Jews and Christians worship the same God and that Nazism was not a "Christian phenomenon." The statement, called "Dabru Emet" ("Speak Truth"), was signed by more than 160 Orthodox, Conservative and Reform rabbis, and was published in an ad in The New York Times. Since the Holocaust, the treatise said, Christianity has changed dramatically. An increasing number of official Church bodies, both Roman Catholic and Protestant, have made public statements of their remorse about Christian mistreatment of Jews and Judaism." "It is historic," said Eugene Fisher, director of ecumenical and interreligious affairs of the National Conference of Catholic Bishops. The mainstream churches, he told The Jerusalem Post on September 8, are "changing their attitudes, doctrine, theology toward Jews and Judaism. This is a document that takes that into account." "Jews need to learn what forms of Christianity are friendly and merit support, and to acknowledge that there are those in the Christian world who have devoted themselves to interfaith issues and taken risks to combat Christian antisemitism," said Rabbi David Sandmel, of the Baltimore institute, on September 8. In the Jewish world, there is "an ignorance of Christianity, a tendency to view the Christian world as monolithic and a tendency to view all Christians as antisemites and or as Nazis. That is part of the motivation behind this - to encourage Jews to take a deeper look at the Christian world." . . . The statement covers overlapping layers of theological, historical and political ground. It said that Jews and Christians worship the same God. "While Christian worship is not a viable religious choice for Jews, as Jewish theologians we rejoice that, through Christianity, hundreds of millions of people have entered into relationship with the God of Israel,"
SCRIPTURE: "How good and how pleasant it is when brothers live together in unity!" (Ps. 133:1). This statement, which represents Orthodox, Conservative and Reform Judaism, claims that "Jews and Christians worship the same God." [Really? Do the Jews worship Jesus Christ?] Furthermore, the Jewish rabbis perceive Roman Catholicism as a Christian body along with Protestants who hold Christianity responsible for the Holocaust. However, Christians who do not express this view or fail to recognize Judaism as a true religion are considered "anti-semites" or Nazis. The conclusion of the matter is that "Christian worship is not a viable religious choice for Jews" but "through Christianity, hundreds of millions of people have entered into relationship with the God of Israel." Christians who have thus surrendered their distinctive faith in Jesus Christ are considered "brothers" by the Jewish community. This, we may assume, is the Spirit of Elijah! In the final analysis, put bluntly, a dumbed-down Christian community has been outwitted by a global coalition of smart Jews. Although Christians and Jews are both awaiting the prophet Elijah, their underlying reasons for this expectation are radically different. While Christians await Elijah to fulfill chapter 11 of the book of Revelation, the Jews -- having rejected Jesus Christ and the ministry of John the Baptist as His forerunner as revealed in the New Testament -- are still looking for the fulfillment of Malachi 4:5,6!!! 4 Remember ye the law of Moses my servant, which I commanded unto him in Horeb for all Israel, with the statutes and judgments. 6 And he shall turn the heart of the fathers to the children, and the heart of the children to their fathers, lest I come and smite the earth with a curse. This is doubtless intended for a solemn conclusion, not only of this prophecy, but of the canon of the Old Testament, and is a plain information that they were not to expect any more sayings nor writing by divine inspiration, any more of the dictates of the Spirit of prophecy, till the beginning of the gospel of the Messiah, which sets aside the Apocrypha as no part of holy writ, and which therefore the Jews never received. I. They must keep up an obedient veneration for the law of Moses (v. 4) . . .
1. Who this prophet is that shall be sent; it is Elijah. The Jewish doctors will have it to be the same Elijah that prophesied in Israel in the days of Ahab--that he shall come again to be the forerunner of the Messiah; yet others of them say not the same person, but another of the same spirit. It should seem, those different sentiments they had when they asked John, "Art thou Elias, or that prophet that should bear his name?" John i. 19-21. But we Christians know very well that John Baptist was the Elias that was to come, Matt. xvii. 10-13; and very expressly, Matt. xi. 14, This is Elias that was to come; and v. 10, the same of whom it is written, Behold, I send my messenger, ch. iii. 1. Elijah was a man of great austerity and mortification, zealous for God, bold in reproving sin, and active to reduce an apostate people to God and their duty; John Baptist was animated by the same spirit and power, and preached repentance and reformation, as Elias had done; and all held him for a prophet, as they did Elijah in his day, and that his baptism was from heaven, and not of men. Note, When God has such work to do as was formerly to be done he can raise up such men to do it as he formerly raised up, and can put into a John Baptist the spirit of an Elias. 2. When he shall be sent--before the appearing of the Messiah, which, because it was the judgment of this world, and introduced the ruin of the Jewish church and nation, is here called the coming of the great and dreadful day of the Lord. John Baptist gave them fair warning of this when he told them of the wrath to come (that wrath to the uttermost which was hastening upon them) and put them into a way of escape from it, and when he told them of the fan in Christ's hand, with which Christ would thoroughly purge his floor; see Matt. iii. 7, 10, 12. That day of Christ, when he came first, was as that day will be when he comes again--though a great and joyful day to those that embrace him, yet a great and dreadful day to those that oppose him. John Baptist was sent before the coming of this day, to give people notice of it, that they might get ready for it, and go forth to meet it. 3. On what errand he shall be sent: He shall turn the heart of the fathers to their children, and the heart of the children to their fathers; that is, "he shall be employed in this work; he shall attempt it; his doctrine and baptism shall have a direct tendency to it, and with many shall be successful: he shall be an instrument in God's hand of turning many to righteousness, to the Lord their God, and so making ready a people prepared for him," Luke i. 16, 17. Note, The turning of souls to God and their duty is the best preparation of them for the great and dreadful day of the Lord. It is promised concerning John, (1.) That he shall give a turn to things, shall make a bold stand against the strong torrent of sin and impiety which he found in full force among the children of his people, and beating down all before it. This is called his coming to restore all things (Matt. xvii. 11), to set them to rights, that they may again go in the right channel. (2.) That he shall preach a doctrine that shall reach men's hearts, and have an influence upon them, and work a change in them. God's word, in his mouth, shall be quick and powerful, and a discerner of the thoughts and intents of the heart. Many had their consciences awakened by his ministry who yet were not thoroughly wrought upon, such a spirit and power was there in it. (3.) That he shall turn the hearts of the fathers with the children, and of the children with the fathers (for so some read it), to God and to their duty. He shall call upon young and old to repent, and shall not labour in vain, for many of the fathers that are going off, and many of the children that are growing up, shall be wrought upon by his ministry. (4.) That thus he shall be an instrument to revive and confirm love and unity among relations, and shall bring them closer and bind them faster to each other, by bringing and binding them all to their God. He shall prepare the way for that kingdom of heaven which will make all its faithful subjects of one heart and one soul (Acts iv. 32), which will be a kingdom of love, and will slay all enmities. 4. With what view he shall be sent on this errand: Lest I come and smite the earth, that is, the land of Israel, the body of the Jewish nation (that were of the earth earthy), with a curse. They by their impiety and impenitence in it had laid themselves open to the curse of God, which is a separation to all evil. God was ready to smite them with that curse, to bring utter ruin upon them, to strike home, to strike dead, with the curse; but he will yet once more try them, whether they will repent and return, and so prevent it; and therefore he sends John Baptist to preach repentance to them, that their conversion might prevent their confusion; so unwilling is God that any should perish, so willing to have his anger turned away. Had they universally repented and reformed, their repentance would have had this desired effect; but, they generally rejecting the counsel of God in John's baptism, it proved against themselves (Luke vii. 30) and their land was smitten with the curse which both it and they lie under to this day. Note, Those must expect to be smitten with a sword, with a curse, who turn not to him that smites them with a rod, with a cross, Isa. ix. 13. Now the axe is laid to the root of the tree, says John Baptist, and it is ready to be smitten, to be cut down, with a curse; therefore bring forth fruit meet for repentance. Some observe that the last word of the Old Testament is a curse, which threatens the earth (Zech. v. 3), our desert of which we must be made sensible of, that we may bid Christ welcome, who comes with a blessing; and it is with a blessing, with the choicest of blessings, that the New Testament ends, and with it let us arm ourselves, or rather let God arm us, against this curse. The grace of our Lord Jesus Christ be with us all. Amen. 10.